Ligand residence times and binding rates have been found to be useful quantities to consider during drug design. The underlying structural and dynamic determinants of these kinetic quantities are difficult to discern. Driven by developments in computational hardware and simulation methodologies, molecular dynamics (MD) studies on full binding and unbinding pathways have emerged recently, showing these structural and dynamic determinants in atomic detail. However, the long timescales related to drug binding and release are still prohibitive to conventional MD simulation. 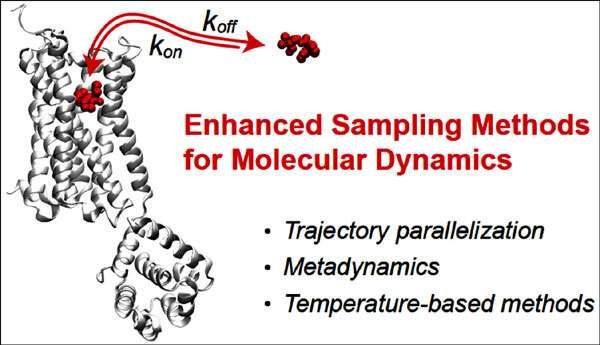 Here we discuss a suite of enhanced sampling methods that have been applied to the study of full ligand binding or unbinding pathways, and reveal the kinetics of drug binding and/or release. We divide these sampling methods into three families (trajectory parallelization, metadynamics, and temperature- based methods), and discuss recent applications of each, as well as their basic theoretical underpinnings including how kinetic information is extracted. We then present an outlook for how the field could evolve, and how the rich variety of sampling methods discussed here can be leveraged in the future for computationally driven drug design. Keywords: Drug design, Kinetics, Metadynamics, Molecular dynamics, Simulation methodologies, NMR. Keywords:Drug design, Kinetics, Metadynamics, Molecular dynamics, Simulation methodologies, NMR. Abstract:Ligand residence times and binding rates have been found to be useful quantities to consider during drug design. The underlying structural and dynamic determinants of these kinetic quantities are difficult to discern. Driven by developments in computational hardware and simulation methodologies, molecular dynamics (MD) studies on full binding and unbinding pathways have emerged recently, showing these structural and dynamic determinants in atomic detail. However, the long timescales related to drug binding and release are still prohibitive to conventional MD simulation. Here we discuss a suite of enhanced sampling methods that have been applied to the study of full ligand binding or unbinding pathways, and reveal the kinetics of drug binding and/or release. We divide these sampling methods into three families (trajectory parallelization, metadynamics, and temperature- based methods), and discuss recent applications of each, as well as their basic theoretical underpinnings including how kinetic information is extracted. We then present an outlook for how the field could evolve, and how the rich variety of sampling methods discussed here can be leveraged in the future for computationally driven drug design.